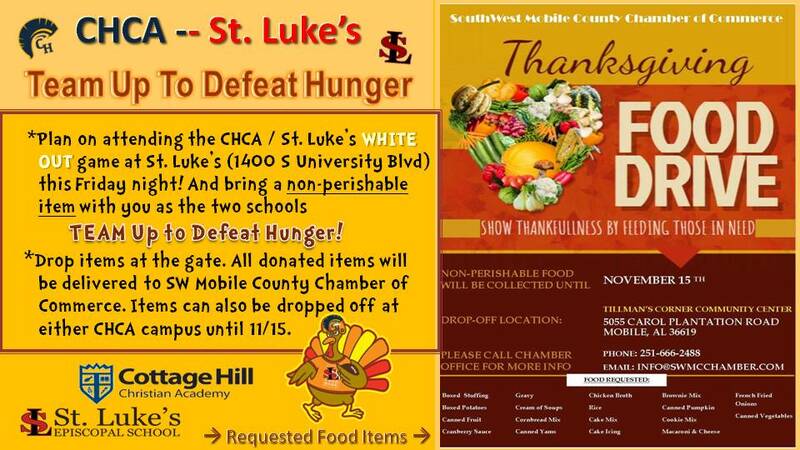 CHCA is teaming up with South West Mobile County Chamber of Commerce and St. Luke's to DEFEAT HUNGER. Help us out by bringing non-perishable food items to this Friday's WHITE OUT game @ St. Luke's newly renovated home stadium on 1400 S University Blvd. Drop off your item at the gate and help cheer CHCA to victory! Food items can also be dropped off on either campus until November 15th.